pdfsubject = Where Are My Spaces? Although I could simply write those options in the document, they need to be in the class file. So here's my question: how do I preserve the spaces in the string I pass as a parameter? I'm compiling it with LuaLaTeX. Title:          Do You See Spaces Here? 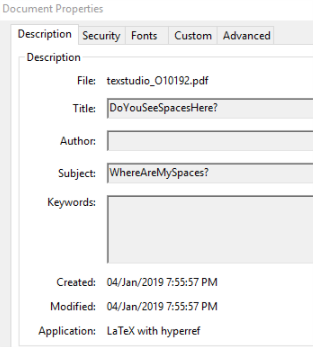 Subject:        Where Are My Spaces? The fact that you need braces to protect the spaces is an unfortunate feature of the core latex option handling, the fact that you need double braces and a space before the comma seems to be a feature of xkeyval's version of key=value parsing. Not the answer you're looking for? Browse other questions tagged luatex documentclass-writing parameters class-options or ask your own question. Why is the “geometry” package passed an unwanted argument?